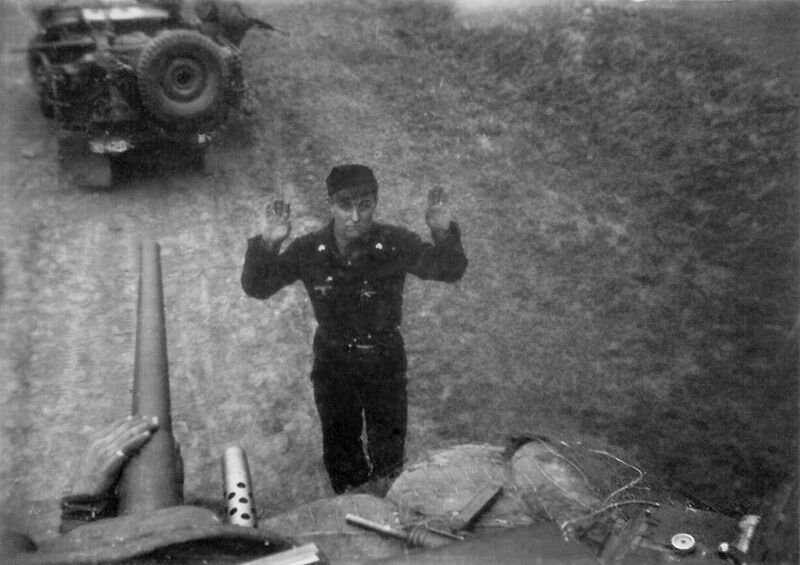 I’ve said it for years, since I was first privately shown it by the American tank commanders whom I interviewed in 2001, that this photo would be destined to become one of the iconic photographs of the twentieth century. Now it looks as if many people agree with me-since being discovered at my website, it’s now apparently been labeled as one of the 40 Of The Most Powerful Photographs Ever Taken “A moving collection of iconic photographs from the last 100 years that demonstrate the heartbreak of loss, the tremendous power of loyalty, and the triumph of the human spirit.” It’s also been viewed over 15 million times at the Old Photo Archive on Facebook..
Look at it. Think about it. The short version of this story is that on Friday, April 13th, 1945, in the heart of Nazi Germany, American soldiers saved 2500 helpless human beings from probable death. They ended a horrific episode endured by these people and gave them new life. 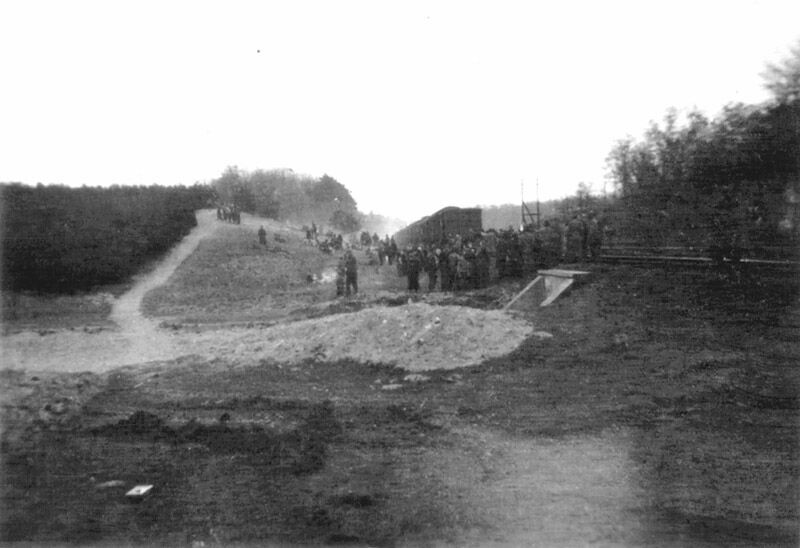 I personally know two of the three Army officers who were present when this photograph was taken, and a third who transported the victims out of harm’s way the following morning. And as a history teacher, I worked to reunite them with the hundreds of Holocaust survivors who were liberated by them personally on those days. In greater detail, I have the REAL STORY behind what happened in my book. And an even greater story is unfolding now, across time and space, through tragedy and triumph, with tears and with laughter. Can you even imagine what unfolds as they re-meet each other after 65, 70 years? The liberating soldiers uniting with the actual people they saved? In this blog we tell the stories. And below you can find the photographs, originally annotated and sent to me with his blessings by George Gross, one of the tank commanders. We may have an idea of the identity of the mother and daughter in the photo here, though for now they remain anonymous for privacy reasons and less than 100 percent certainty. But we have found many others still living who do recognize themselves in Dr. Gross’ photos. You see, then Sgt. Gross had a small Kodak Brownie camera that his wife had sent to him in combat. Before I helped the United States Holocaust Memorial Museum acquire them in 2013, they had never been seen outside of family and friends. What makes these photos so special is that they reveal the moments of liberation. 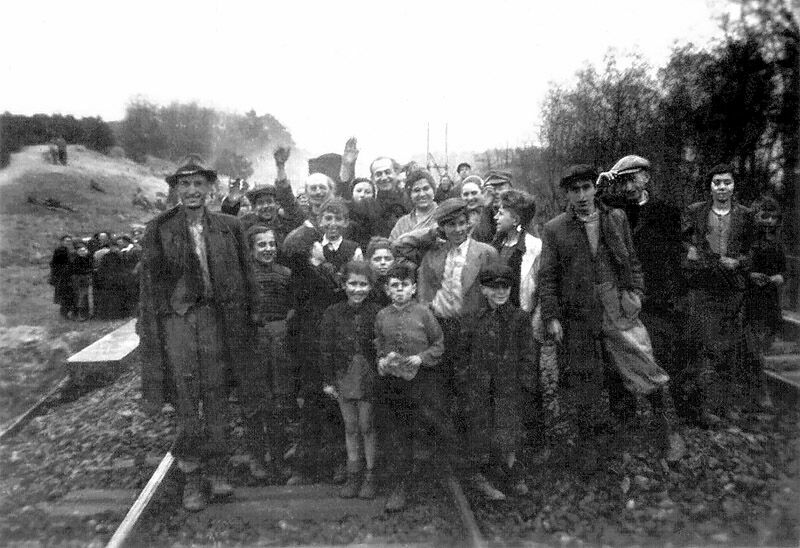 Still, it is important to be clear that most existing photos of the Holocaust, and Jewish prisoners and trains, are the horrifying images of victims being transported or offloaded at death camps to be murdered. So this collection of photos is a rarity, and should not be considered an exemplar of the real horror that unfolded; rather, perhaps it derives its power as a testament to the power of the good, as well as the evil, that men are capable of. 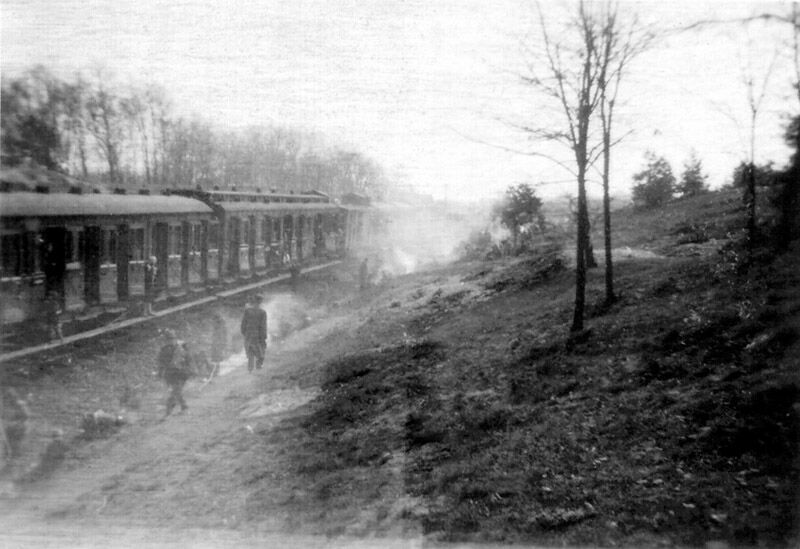 l. (Train Saved 1) This marvelous picture was taken by Major Clarence L. Benjamin at the instant a few of the train people saw our tanks and first realized they had been liberated. Many of those close to the train are not yet aware of their liberation. My tank is just behind the camera. 2. (Train 1) This is a view of the train from the rear, showing boxcars like those in picture 1. On the hill to the left are people resting–some forever. 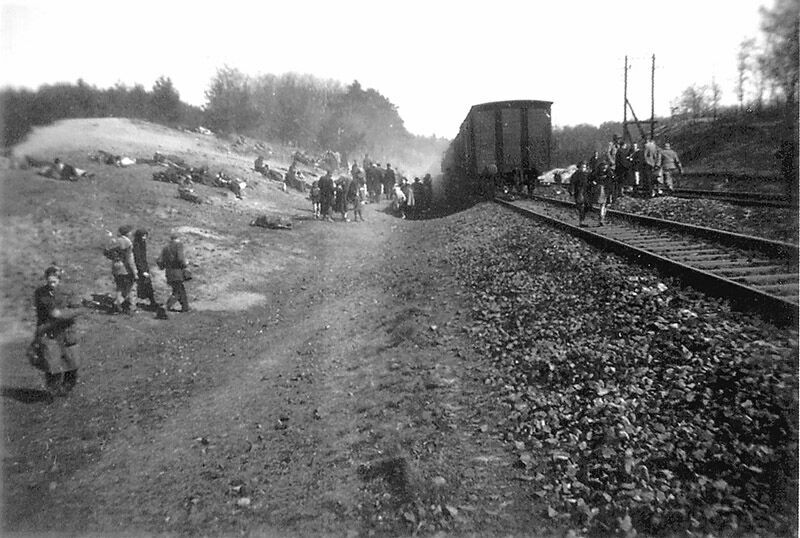 Some sixteen died of starvation before food could be brought to the train. 3. (Train 2) This is a closer view of the scene in the previous picture. Note how quickly the starved people have regained their sense of purpose and are scrounging about for berries and other food. 4. (Train 3) This view shows compartment cars. Most of the train was made up of boxcars. It looks as though one man at lower left is praying; others are sitting or lying on the ground. 5 . (Mother and Son) I find this picture very moving: mothers love to show off their youngsters, no matter what the situation. The little fellow was pleased at having his picture taken. Note the thin legs and brave smile. 6 . (Saved 2) This is a shot of others on the train. 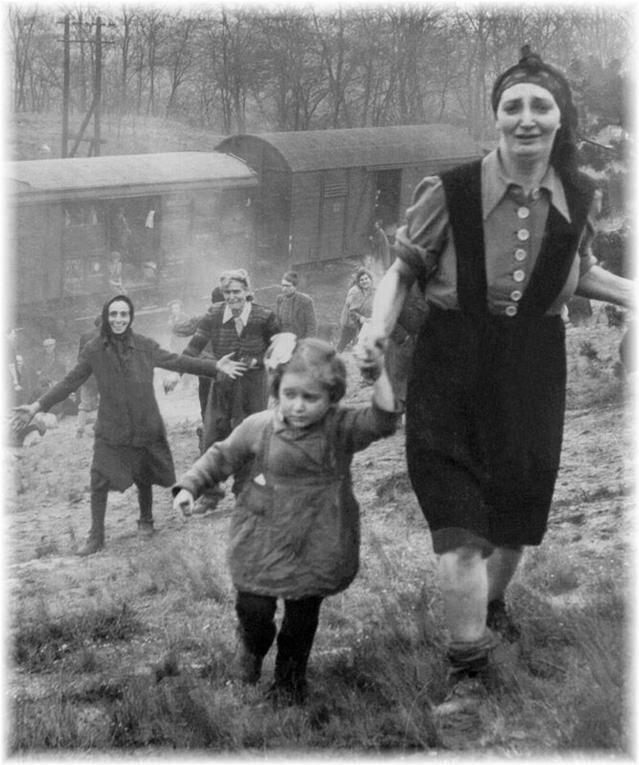 The women and children in this and the following picture demonstrate the error in “A View from the Turret’s” statement that the train contained only Finnish men. I am moved still by all those smiles, particularly the one on the thin little girl in front at the left. 7 . (Saved 1) This picture has some moving contrasts. Note the laughing children at the left, and then look up to top center where a living skeleton sits and, I think, waves for the camera. 8 . (Gina) This is Gina Rappaport, who spoke very good English and spent a couple hours telling me her story. I have notes packed away somewhere but have never felt up to trying to make an essay of them. 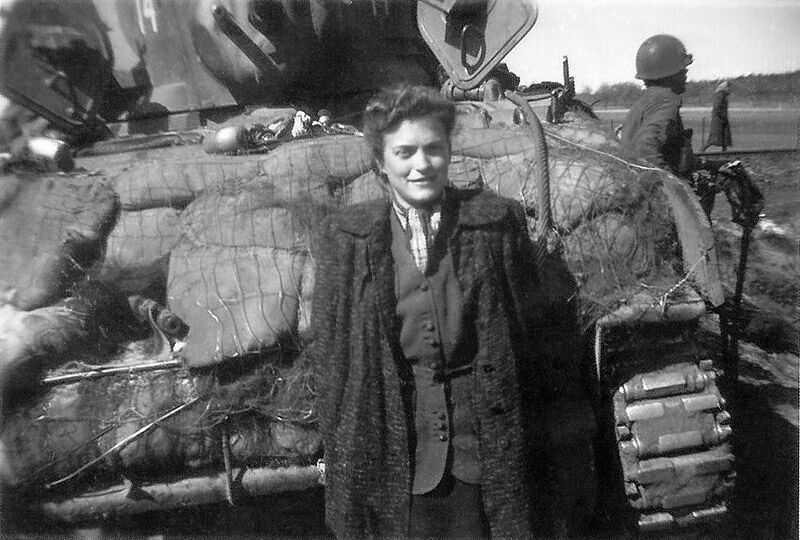 She was in the Warsaw ghetto under terrible conditions, and then was sent to Bergen-Belsen. 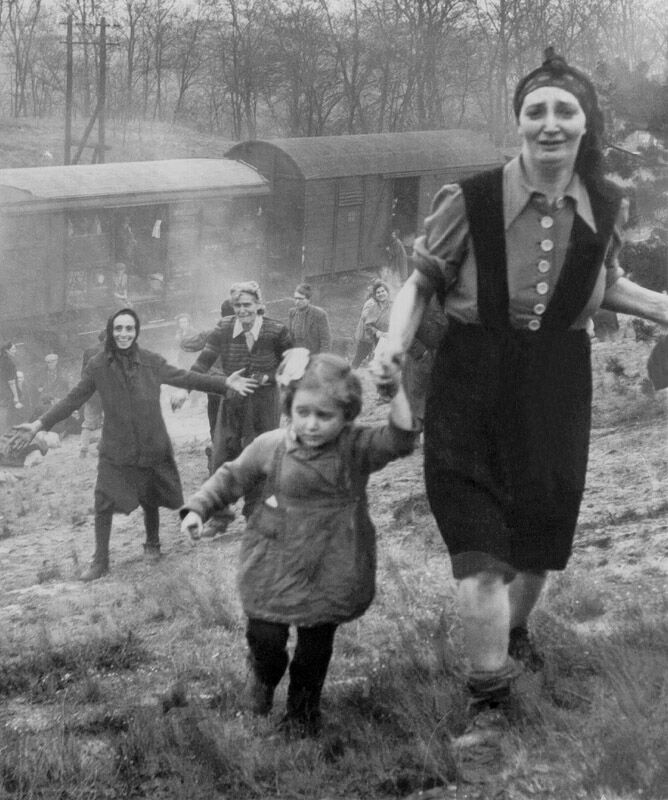 She said that the people on the train had been hurriedly jammed into cars and sent on a meandering journey back and forth across central Germany to escape the British, American, and Russian troops. The attempt was evidently to get them to a camp where they could be eliminated before they could be liberated. 9. (Starvation) This one, too, is very moving. 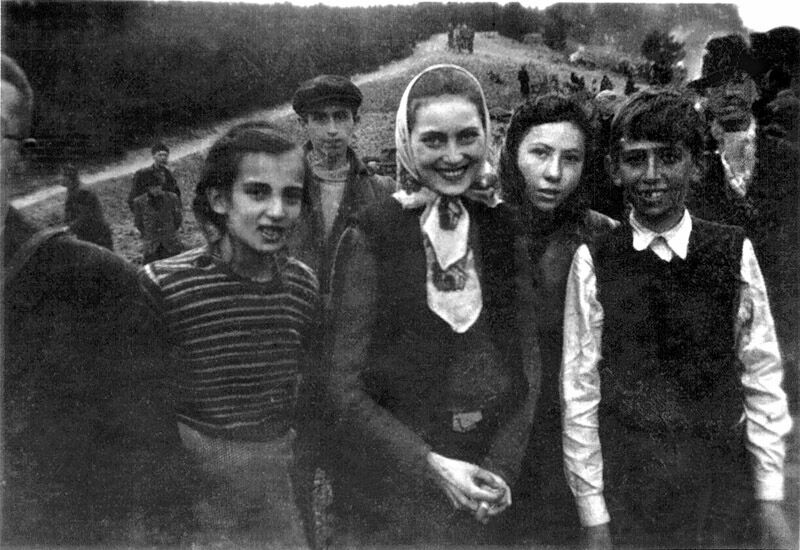 My original note says, “The little girl in the middle is so weak from starvation she can hardly stand–yet she has a smile for her ‘liberators. '” One might say exactly the same of the two children on either side. 11. 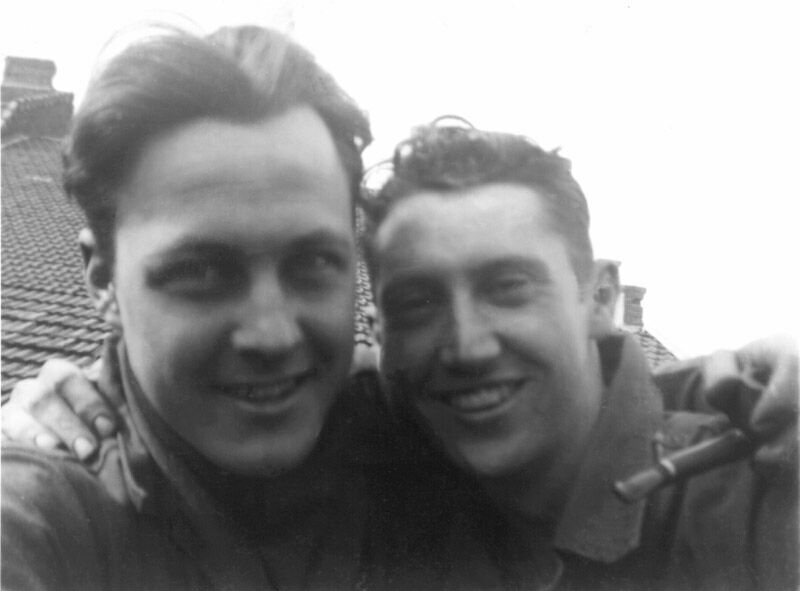 (George Gross and Red Walsh) This is a picture of two comrades who depended upon each other in the war and still correspond regularly. I am the one on the viewer’s left; on the right is Judge Carrol S. Walsh, who was with me at the train and at most of our memorable experiences in combat. and if you did read it, PLEASE leave me one! There is also a documentary in the works. Matt, My heart was full of joy, hope and appreciation to you today,listening to you, as the key person who recognized a story which needed to be told, set a path of discovery and fact finding and then “liberated” this important piece of our history. I’m so thrilled to witness today in person the sharing of love between the survivors and their liberators, hearing the stories and memories. You are right..it brings such hope for a better world. Hello Matt…my name is Fran Becht…I just finished your book regarding the train…it was awesome. I am anxious to read the “Things my father saw”…I am a US Navy veteran abd served in Viet Nam during 1969-1970. My Dad was a MSGT with the 1st Marine Division in Guadalcanal, New Guinea, Cape Gloucester and some other Pacific Islands. Thank you for this very important ministry…Let Us Never Forget!! God bless you and all those who suffer the indignities that man has done to his own kind. I am truly just speechless, and don’t even know where to begin. I guess I’ll start by saying that I am grateful to you for having the dedication, ambition, and strength to have written this book. You spent years educating others, compiling information, and being the liaison for all of the survivors and soldiers you so diligently helped to reunite. You told their story with dignity, respect, and precision. The soldiers and medics are the saviors of these courageous victims, but you are the true hero for making it all actually come to light, causing them to have a real voice, and allowing them to find closure within their meetings. I have always felt connected to the horrors of the Holocaust, as one who is Jewish, but even more so as a human being who is just appalled by the inhumanity of one man and his mindless followers. I have read so much about it ever since I was a kid, and was introduced to books like Anne Franks diary and Night by Eli Weisel, have always wished to be able to do something about it, yet never knew what I could possibly do as one person, with events of years ago. I thought and desired to somehow help make a difference for all of those who burdened the atrocities of the Nazi’s, or at the very least, make the stories of these resilient people more known and never forgotten. But you did more than think or wish it- you found that way, and you did something, and for that, I find you a hero as well. I feel as though you single handedly have so significantly helped these Holocaust survivors and saviors, while also profoundly making a mark in the huge work of carrying on the memories of this horrific time in history. I am a 40 year old mom of 2, aunt of 5, who will definitely be using your book with my own kids, and you’ve also inspired me to go back to teaching Sunday School again, as I did years ago. My family is not very religious since my grandparents all passed , and my own kids are half Jewish now, but reading your book captured my full attention and again made me realize I have done nothing but educate myself about this subject, and I’m ashamed that I have allowed it to slide. This is how things escape future generations- it starts with the passing of our elders, and only we can keep the stories alive and going. It’s time to be more like you, and ‘do’, not just ‘think’. Kudos Matt, as in this world, especially the one we live in today, it is way too easy to simply regard the Holocaust nightmare as just another historic event we read about in school, while never realizing the enormity of the truth and impact it had on millions of people all over the world. Thank you for all you’ve done and the person you are. Your comment is so meaningful, and insightful. I read it yesterday and it truly made my day, my December, my year. This is why I had to write the book. Thank you, Janessa. Thank you Matt. Your book tells the truth about the holocaust like none I have read. I wish more could know of the atrocities committed by the Nazi but, unfortunately, many don’t want to be troubled or depressed. There is an old saying, “Those that do not know history are bound to repeat it”. Let’s pray not! I am so grateful to read the first-hand accounts of the warriors and survivors of the war. As a Jew, it is particularly meaningful to read of the atrocities. Your documentation is impeccable and I’m apprecative that you’ve given your lifetime to this project. Wishing you every success possible for remembering the past so we can live the future. May Gd bless you always. 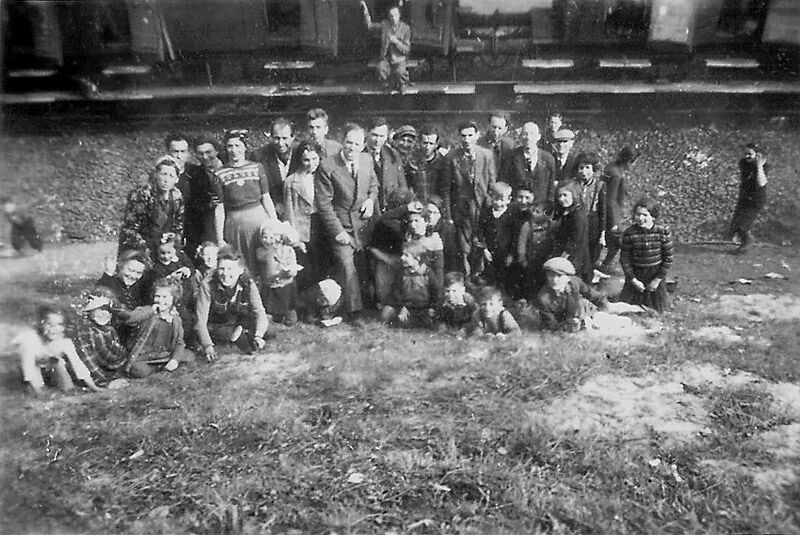 My father was a Dutch national that was forced to a slave labor camp and sent to work for Krupp Iron Works. 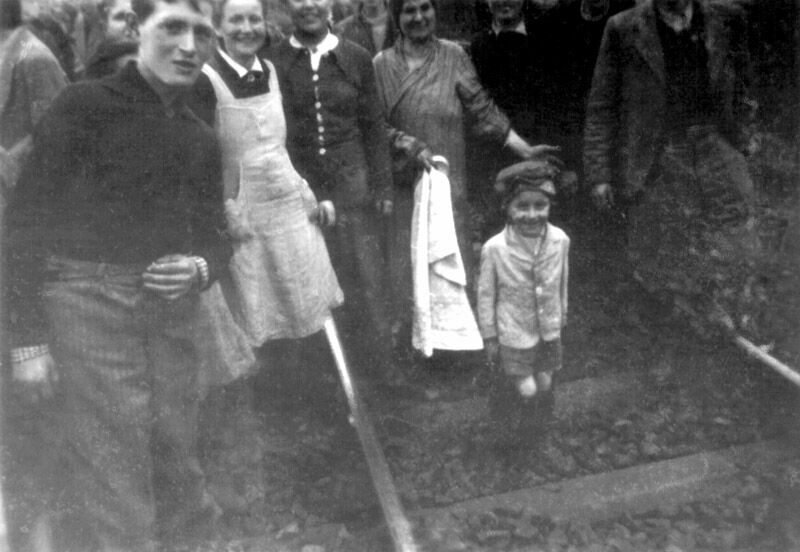 He escaped during a bombing and was aided by the French Underground and by a farm family in Belgium. I knew all of this from the time I can remember, but I wished I had asked more questions. He clearly lived since I am one of four, was a Dutch transfer marine and met my mother in Quantico, West Virginia. Thank you for writing this. I’m sure it had to be very difficult for you to revisit those memories, but it’s important that you did. It must never be forgotten.